The murder of reputed crime kingpin Hebby Swarf.A mysterious hooded figure. A note left by the bosy simply reads 'Justice is done'. Judge Dredd is on the scene and believes (correctly) that a vigilante is on the loose. Meanwhile, an attractive woman (rendered with some great art from Carlos Ezquerra, really capturing the beauty of woman with a futuristic look) books a table at the 'Highlight Rooms', as the TV news plays out in the background with its depressing list of despair and death. Later on, at the Highlight Rooms, the woman explains that she is waiting for her husband, then slips out, as the hooded 'Executioner' to deliver justice to 'Mr Beauty', a racketeer, and his henchman. 'Murder is murder, no citizen can be allowed to take the law into their own hands'. The investigation quickly progresses with a photofit of the suspect for the Judges to work on. In another plot development we see that the woman (aka 'The Executioner') has 2 children. As they watch the news of the killing of 'nightclub owner and suspected racketeer' Jack Beauty, the son tells his mother that Beauty was one of the 'skunks who'.. but his mother hushes him before we learn 'what' exactly. A TV poll shows only 1% of the population is against the actions of The Executioner. Following the photo fit breakthrough, Judge Dredd harasses a female judge, De Gaulle, who looks similar to the photo fit and could be the 'perp'. She denies this accusation, and lie detector tests confirm that she is telling the truth. 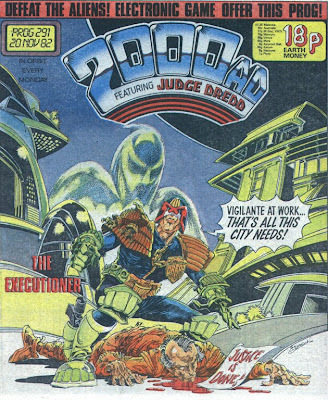 Dredd is called to a suspected Executioner slaying, but a clumsy 'justice is dun' note reveals it to be a copycat killing. The copycat proudly owns up to being the 'executioner' (which he isn't), and for his trouble gets thirty years prison time. Continuing her bloody retribution, The Executioner goes to 'Chivo Bros Discount Depository of the Semi Dead', where she books a suspended animaiton vault place for a Nicholas Tatum. As one of the Chivos Brothers recognises the name, the vigilante steps back and blasts him. Rafael Chivo, the other brother, realising that he is in grave danger, but fails to escape. He is knocked out, and when he regains consciousness he finds himself in a vault. Chivos is seen pleading that he did not kill Tatum, and the hooded figure agrees that he didnt pull the trigger, but he was responsible for the death of her husband. With that, she slams the vault shut, and Chivos is quickly overcome by liquid nitrogen fumes. Another 'justice is done' note is left at the scene. The Judges find the bodies of Mo and Rafel Chivo. We learn that they were body sharks - so, like the other victims of the vigilante, they were 'villains'. When Dredd is informed at the scene that rookie Judge had found the bodies, Dredd realises that the killer must have been a rookie at some point, as he had already checked all Judges as possible suspects. Quickly, Dredds bike computer confirms it - the Executioner is a Blanche Kominsky, a rookie who was expelled for an illegal liason with a non-judge. She later married, and became Blanche Tatum. Her husband, Nicholas, had recently killed himself after getting into trouble with loan sharks. The financiers of the loan were Swarf, Beauty and the Chivos brothers. Elsewhere, the mother and children have a tearful farewell, with the mother ordering the children to go to their grandmothers. It seems as if the children understand that this may be the last time they see their mother. Judge Dredd, on the trail of Tatum, runs a check on any other people who may have been involved in the loan deal - and Dutch Sagans name comes up. The story then cuts to Sagan, who, fearful for his life, tries to call a henchman, who is already dead at the hands of the Executioner. She catches Sagan, who tries to escape, just as the Judges arrive in force. Blanche Tatum manages to hold off the judges while she corners Sagan, and as he cowers, she kills him, completing her revenge. As she emerges from killing her final victim, Dredd tells her that it's all over, to which Tatum agrees. She is brandishing her gun. Dredd responds quickly, shooting her and Tatum drops to the floor. We learn that her gun wasn't loaded. She obviously wanted to die, having got her revenge. This is one of the great Dredd stories in my opinion. Very much a product of the times, when vigilante fiction was mainstream with the likes of the 'Death Wish' sequel and the 'Guardian Angels' were a very real representation of people power, this tale retains its emotional power today. Not because it is epic in scale, which it isn't (though Mega City One is still coming to terms with the aftermath of The Apocalypse War). It is because the story is small scale and a very human tragedy. It deals with a family torn apart by death. A woman and a mother gets her revenge, but pays with her life. What happens to the children? Is revenge a valid course of action in a world where there are self-appointed Judges, who dispense instant justice? The story is taught and tinged with sadness, such as in the scene at the Highlight Club where Blanche announces that her husband will not be joining her, or when the children are seen, clearly affected by the death of their father. The final twist, where Tatum is revealed to have no bullets in her gun when she confronts the Judges, is a sombre one. Why did she want to die? To be with her husband? Because she couldn't bear her children seeing her in prison? The art, from original Dredd artist Carlos Ezquerra, is wonderful, whether it is capturing the idiotic posturing of the 'wannabe' Executioner, the tragic beauty of Blanche, or the final desperate moments of Rafael Chivo and Dutch Sagan.